Halloween Books is a unique needlepoint canvas from Alice Peterson. 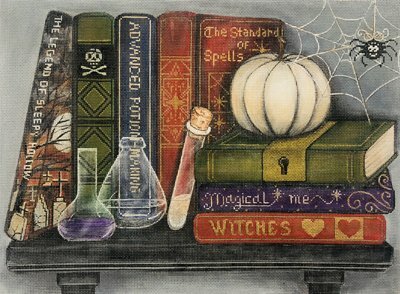 It features book spines of Halloween books lined up on a shelf with spiders and potion bottles. The design area measures 15" x 11". The design is handpainted onto 13 mesh mono needlepoint canvas so you can stitch in all this lovely detail. This Halloween Books needlepoint can be purchased with or without fibers. If you select cotton we will send DMC cotton floss. For wool and silk we will send Planet Earth fibers which are single-ply for 13 mesh and easy to stitch with. If you need stretcher bars we recommend a pair of 19" and a pair of 15" bars and some thumb tacks.